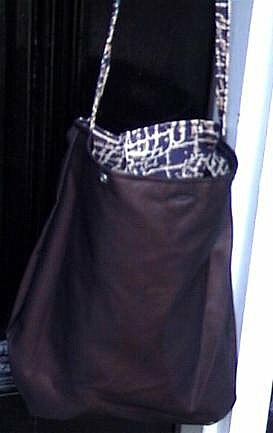 Effective 9-9-08, I'm putting this nice tote on sale for just $25.00. The strap is 28 inches total. This purse hangs under your arm. The inside is lined and interfaced. 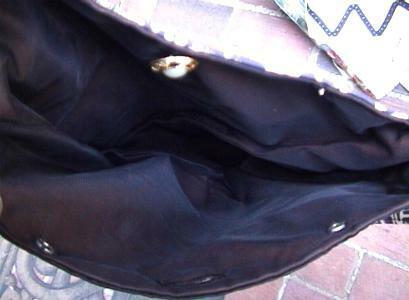 You will be able to fit your wallet, cellular phone, make up and a few other items inside easily. 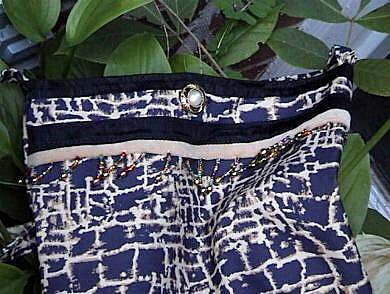 I sat and handstrung and attached beads across the front top of this bag. The bag is turned wrong side out in the photo below. You have the option to close this handbag with the pretty white and gold button, or with the snaps inside. Made in a smoke-free, pet-free home in Atlanta, Ga USA.